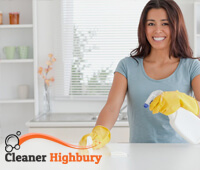 Our company has long specialized in providing a wide range of cleaning services for its revered customers in Highbury. We collaborate with responsible and hard working employees that have passed preliminary trainings and know how to manage with every cleaning task in an effective way. We provide flexible working schedules and great availability for the customers and we are always punctual in the arrangements. Thanks to the experience that we possess we can guarantee perfection in every detail and full cleaning according to all the standards. Our staff is disciplined and supplied with the most modern cleaning equipment on the market. What differs us from other companies is the fact that we always try to take into account the preferences of our customers. We are determined to prove to you that we can make your properties sparkling clean and shiny very easily. 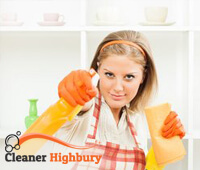 We offer end of tenancy cleaning that is implemented in a completely professional manner by our dedicated cleaners. Thanks to it, our customer will immediately take their deposits back, once we finish with the cleaning procedures. In the end of tenancy cleaning we include cleaning from top to bottom, as well as sanitizing of the bathroom and toilet facilities. Another services that is provided by our company is domestic cleaners. Thanks to them you can quickly have your home cleaned from all the stains and dirt. Whenever you need professional gardeners in Highbury, you can also count on our experienced company. We collaborate with recognized gardeners who will use the latest gardening approaches. Another service that you can book is the oven cleaning, thanks to which you will easily have your oven entirely cleaned from the grease and stains. In case you have any further questions, do not hesitate to use our customer support centres and to discuss your preferences with our cheerful staff.